We compiled a list of snow ski equipment which relates to to a lot of skiers. This list of gear and accessories may be helpful to have on your next ski expedition. You may find some of the equipment to be of greater importance than other. Check it out, and judge for yourself. If you are into gadgets, give some thought to altimeters. These toys can give barometric measurements, weather forecasts, altitude, stopwatch functions and even measure your heart rate. There are a lot of cool models available. Some offer the means for plotting your ski route. For a review these gadgets, visit here. These are cool fashion accessories for good sunny weather. Some types offer a mild degree of insulation, but for the most they are simply - hip. The waterproof variety is a great accessory to your snow ski equipment as they can contain anything from the emergency survival equipment, through to the food supply.A good alternative is a purpose build,or integrated hydration pack. There are fundamentally two types of shoe designs, top entry boots and rear slide in entry boots. First the rear entry boots. These have had their claim to fame as they were very easy to put on. The shortfalls I have encountered were that the range of adjustments they gave you in strapping your foot in was limited. Additionally a lot of them leak, if you wear them in excess of about 4 hours. If they appeal to you, at least ensure your foot is comfortable. Top entry boots in my view are the better way to go, as the range of adjustments available is far greater. Often however they can be a hassle to put on. If you have a break half way during the day, and then try to reinsert your foot into the boot, some people struggle. They require a little bit more patience, flipping and loosening of the clamps, but well worth while in the end. This is a must of your snow ski equipment. Inserts for these ski boots do vary. Manufacturers of boots have been quite innovative, offering pre fabricated moulds that fit most feet. They also offer polymer inserts, which over time conform to your foot shape. The polymer learns what your foot contour is, and slowly reshapes itself to your foot. Then you have injectable moldable inserts. With these a resin is poured around your foot, whilst your foot is inserted into the boot. The resin fills a double walled sock, around your foot, and sets within a short time frame. Presto you have a custom insert! To check out benefits of orthotic boot inserts visit our page here. Adjustments to look out for on your boots, are dials which increase tension around the foot by tightening straps. Then you have feed though clamps. In these a plastic strap feeds through a clamp, varying the tension. Most common are basic clamps, which hook onto boot’s teeth. I think they can be useful to carry anything from your food snack through to your picture camera. Strapping it in front of you protects the content quite well if you happen to fall. 3/ body wrapping thermal layer more. My preference is five fingered gloves, leather outer, and insulated inserts. As soon as you make the move to leather be prepared to treat them with protective aerosol sprays. A lot of glove outers are nowadays made out of waterproof fabrics. In conjunction with insulated inserts, which may be synthetic and fleece filled, they also are a good combination. Some glove inserts use goose down as the insulator. These are also excellent. The better quality gloves do cost a bit, but they will last you years to come. I have on one occasion tried to cheat the cost principle and got cheaper gloves with rubber or latex inserts. That was a big mistake, as it did not take long for my perspiration to soak up my hand. If you travel with little children, tie up two gloves with a string or a cotton line. Feed the line through both sleeves of the jacket, having one glove dangle on one end and the second on the other. This way the gloves will stay connected and your child will never lose them. Good goggles go a long way right? Well.. yes and no. Even if you pay the top dollar, all of them will eventually scratch. My rule of thumb is try not to over do it. Look for firm foam padding, as opposed to the soft variety that crumbles between your fingers. Intake air vents are useful as they reduce the likelihood of fogging. Double lenses also aid with reducing light intensity and minimizing fogging. A sturdy frame construction is also a - must have. Nothing can be more upsetting than frames which warp after being exposed to different temperatures .Goggles always complement my snow ski equipment without fail. If you intend to get a helmet find one which complements the shape of your goggle.Select the lenses carefully, see the article below on sunglasses. Goggles with optical lens inserts. They do exist, and carry an optical frame insert which clips into the goggle frame. Aim for lenses of reasonable size to aid with your peripheral viewing. Another alternative to this snow ski equipment is a goggle designed to fit over your own prescription spectacles. They are a little bigger than standard goggles, sit further from the face to reduce fogging, and are designed to apply less pressure to the temple when the specs sit underneath. Hopefully you end up feeling more comfortable. Having spare caps / beanies/ balaclavas is a good idea.These are of most importance as the heat loss your body endures is though the head. Up to 90% of your body heat is lost through an exposed head. If you ski in extreme weather, loosing the heat, your body starts to have problems regulating it’s owntemperature, and becomes vulnerable to colds and infections. Consider either woolen hats, or ones manufactured out of synthetics. If you have little troopers who don’t wear helmets cover their heads as “wind chill” can lead to thermal deregulation very quickly. Look for helmets, which are seamless one, piece construction ,or have reinforcements as opposed to two piece laminated. The two piece types fracture easier under high-speed impact. Padding inside is a must with reasonably hard foam. Optional extras to look for are ventilators on top of the helmet, so you don’t perspire as much. Another gimmick to look for is a goggle clip, at the back of the helmet. Secure the goggle strap as you are flying down the slopes. Sometimes easy to overlook is the ability of the helmet to accommodate the size of the goggle itself. If your head hits something whilst tumbling down, there is a chance internal lining and outer casing may have suffered hairline fractures, if so get a new helmet. The helmet served its purpose. In my view if you have little children helmets are a great idea. Young children can easily be overlooked on the slopes.More on Ski Helmets. In my view if you have little children, helmets are a great idea. Young children can easily be overlooked on the slopes. Might be useful in some resorts where the lift tickets Is not well laminated behind plastic covers. Although as you ski throughout the day and your jacket gets wet, It is easy to clip the lift pass holder onto another jacket. Carry it in case weather changes with little warning. A woolen scarf will help you conserve heat pretty well, and it does not take up much space. Decide if the synthetic variety is the choice for you, or if you prefer wool as the insulator. The best socks I have picked up were from army disposal places. They cost few dollars and last forever. Look for thick double sole woolen lined socks, which in my view have stood the test of time. This variety may not have the groggiest colors available. Otherwise spend A bit more money and get the season’s offerings. It is not easy to get a sun burn on the snow, so apply at least SPF (sun protection factor 15). For the lady’s fan club, UV light destroys skin’s collagen, and over time gives you wrinkles. This part of your snow ski equipment is receiving more attention in media with increasing hole in the ozone layer. UV treatment to your sunglasses ought to be taken on board. Most countries sell eye wear with UV spectrum protection between 280-360nm (wavelength of ultraviolet) already build into the glasses. They label this range as UVA and UVB protection. This wavelength is most implicated in causing skin cancers; basal cell carcinomas, or melanomas. Front surface of the eye itself , the white layer is prone to get a wedge shaped growth ,from again UV exposure.These occur in outer or inner corners of the eye and are called pterygia . The interesting point is that UV A and B does not include the full UV range. WowWhat am I talking about ? Well the full UV range spans from 280nm up to 400nm .So to be fully covered especially at high altitude skiing consider UV 400 filter. The 360 to 400nm wavelength reaches the earth mainly at high altitude. Normally this wavelength is absorbed by the ozone layer. What is disturbing is that this narrow spectrum reaches the back of the eye and has been implicated in causing damage to the back of the eye. Mirror coated or, titanium coated goggles .Good at reducing Light intensity entering the eye. Just be mindful of nose protection as reflected rays of light will fry your nose. Polarizing filters. -sun glasses, excellent for skiing and my favourite, as they are the only lenses which cut out glare. These make up my arsenal of the snow ski equipment. Snowfields provide abundance of glare making it difficult to judge the contour of the terrain, and these lensesare great. To assist with side protection check out curved lenses. When checking out jackets look for two important characteristics, these are breathibility and a waterproof rating. More on this page. Ensure the seams have been sealed with a resin, to enhance waterproofing. To accommodate any of the snow ski equipment you may be carrying, look for plenty of pockets on the jacket .I think you can never have enough. When I venture out further on the ski slopes I pack a bit more gear. Before you know; one pocket is used for ski goggles, another scarf, spare gloves, wallet, camera if you dare, and the list can go on,So pockets are cool. Choose a jacket with plenty of pockets. Theoretically these braces are supposed to allow the knee to travel in one plane, without rotating sideways. This concept sounds good, given that the most common ski injuries are knee related. Read more on ski braces. My knees are still holding on so I am still at a stage of contemplation. If you are in doubt add them to your snow ski equipment list. Aggie has on the other hand sustained a knee injury in the past, and when fatigued wearing a brace assisted her. Might be useful in some resorts where the lift tickets Is not well laminated behind plastic covers. Althoughas you ski throughout the day and your jacket gets wet, It is easy to clip the lift pass holder onto another jacket. 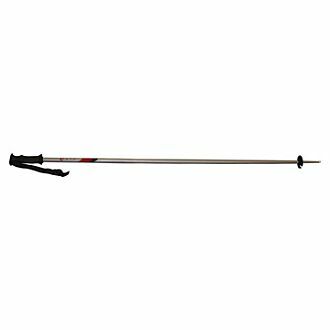 New ski poles are very light weight, usually made of carbon fiber, fiberglass, or light alloy. These are the coolest thing when travelling, as together with rest of the snow ski equipment they weigh next to nothing. As for the profile of a ski pole go for straight ones, as the curved variety is more suited to downhill racing. More on ski poles. I am a bit of a fan of the older full aluminum construction poles. Why you ask? When venturing into wild snow terrain...having been stuck in mounds of powder….it has been easier for me to leverage myself out of trouble. They are much stronger when weightbearing. You could call this the bare essential of ski snow equipment. There are different skis for different ski conditions, and for different terrains. Freestyle Ski. These skis are wide at the front as well as at the back and slightly tapered in, in the middle. Overall they are the widest skis available ( excluding what ski jumpers use). This design allows you to float on fresh powder relatively easily. The contact surface area of the ski is larger than most conventional skis , hence aiding your floatation on the powder. The front and rear tips are curved up to help with bi-directional skiing. Great choice for skiing the virgin snow. I personally feel these skis will make up a bigger segment of the snow ski equipment, as more skiers explore beyond the boundary terrain. All Terrain Ski. In today’s ski arena, the all terrain ski is the carver. You can take them on groomed runs, moguls, powder and some behave well even skiing fast in a straight line. Think of this as a multi purpose ski. They are easy to turn compared to other skis. In fact I think they turn on their own. The degree of flexion varies depending upon what terrain you want to ski. If you are considering to only have one ski type as part of your snow ski equipment, this is the best choice. Racing Skis.A true racing ski is stiffer than any other ski. This attribute makes it a dream if you have the need for speed. The current designs even dampen vibrations you may pick up as you fly down the mountain. They are most predictable when skiing in a straight line. These are the least tapered in of all skis, or least curved on the sides. This attribute gives them a long turning radius, which is what you need when you ski very fast. Classically these skis are very narrow, do not flex much, and so are not well suited to bumpy terrain. For exploring the snow on foot, particularly when traversing flat terrain, there is nothing better. These skis take a totally different boot and binding to other varieties mentioned. Quite often ski equipment manufacturers come up with novelty items. The ride on monorail bike with inbuild spring suspension, steered with short foot mounted skis, has received some attention around the world. They are good fun on gentler slopes. Then the refined invention of a wind-sail, to propel you across the mountain. Forget the ski poles, hold onto the railing of the sail and let it take you for a ride, hopefully not off An edge of a cliff. Short stumped skis are another addition to the snow ski equipment. These are merely longer than the ski boots. Perhaps good fun for goofy turns, just watch them at fast speed as they are quite unstable. Decide if the synthetic variety is the choice for you, or if you prefer wool as the insulator. The best socks I have picked up were from army disposal places. They cost few dollars and last forever. Look for thick double sole woolen lined socks, which in my view have stood the test of time. This variety may not have the grooviest colors available. Otherwise spend A bit more money and get the season’s offerings. Look for same breathing and waterproofing characteristics as you would on a jacket. Concealed zippers, which allow easy access to the undergarments, will help to undress in the time of ‘need ‘. Pants with straps are less friendly in this department. There are also body hugging trousers, which were more of a hit 10 years ago,are better suited for wear in fine weather. For information on different snow tents, visit our page here. I hope this page on snow ski equipment has helped you a little, and perhaps will be of benefit when you are going on your next ski adventure. Useful link on snow ski equipment. From snow ski equipment back to home page.